Ugh…it’s another Monday. I’ve never been a Monday person, I can’t honestly say why either. Monday has never done anything bad to me, but we just don’t get along! So how do I manage to get myself up and ready to deal with the day? I drink a lot of coffee, not just a cup or two, but enough to send my Keurig running for cover. Actually, who am I kidding? It’s not just a Monday thing, but everyday–although Mondays definitely warrant an extra cup or two. My coffee of choice? 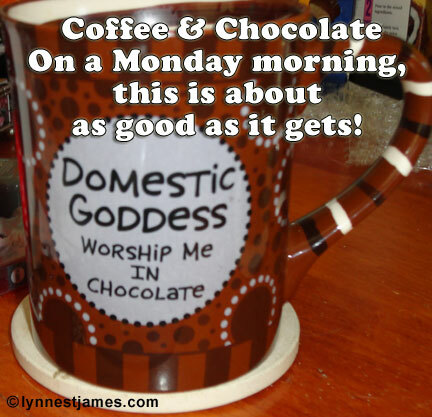 Timothy’s Morning Blend with about a tablespoon of Hershey’s dark chocolate syrup and some fat free half and half. There are weeks I can go through one and a half bottles of that syrup, I guess you could say I am addicted to coffee and chocolate, but really it could be so much worse! So how do you deal with your Mondays? Do you do anything special to start your week off right? Please share! I can use all the help I can get.